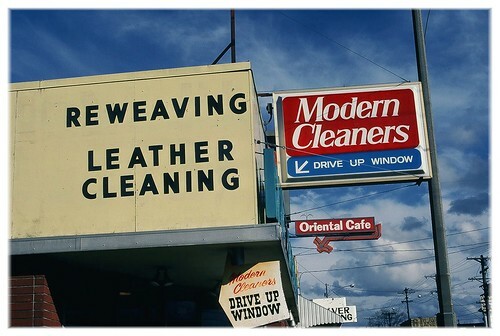 Modern Cleaners signs, 6th Ave., Tacoma. Ahhh, nice. My grandparents started the Modern Cleaners and ran it until the mid-70s. Although this picture is from a more recent date, it’s nice to see it documented. Nothing is better to a kid than riding around in huge laundry carts. Thanks!